Choosing your domain name can take forever! Should you have your name as your domain name? Should you use your business name as your domain name? Or even, should you include a keyword within your domain name? It can be tricky. 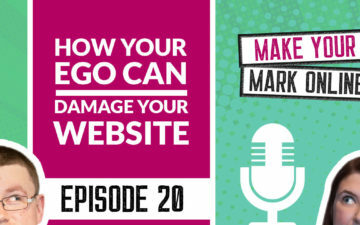 In this podcast episode, we go through the pros and cons of different domain names and which ones are right for you and your business. 3.40- Why would you use your name as your domain name? 6.10 – What are the downsides to having your name as your domain name? 8.37 – Why would you use your business name as your domain name? 11.18 – What are the downsides of having your business name as your domain name? 14.39 – Should you use keywords in your domain name? 18.25 – What’s our favourite method for picking a domain name? 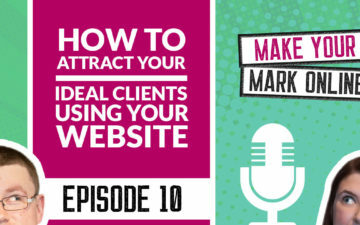 Welcome to episode 11 of the Make Your Mark online podcast. 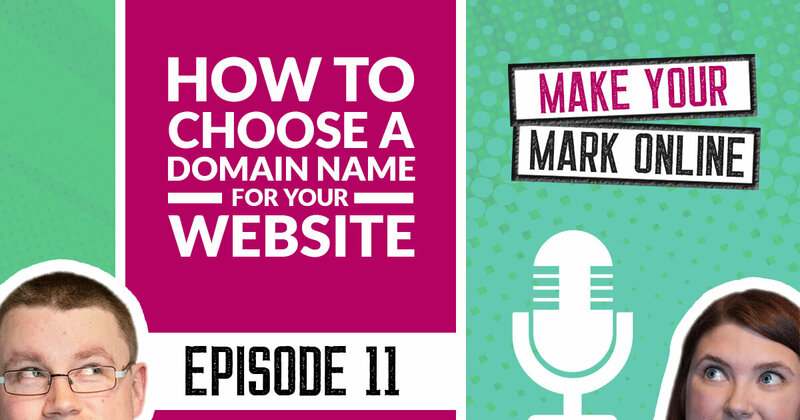 Today we’re going to be talking about how to choose a domain name for your website. Before we get into the episode, this podcast is sponsored by the Make Your Mark online membership. This is our signature membership community where we help personal brands build and grow a successful business website. It will be launching on the first of October and we’d love for you to check it out. We currently have a wait list you can sign up to, if you go to jammydigital.com/wait. We will only be opening the doors for two weeks at its lowest ever price, so don’t miss out. Okay, let’s get on with the show. Today we’re talking about domains. This is something that’s really important, isn’t it Martin, for all businesses? Yes, of course. I mean if you want a website you’re going to have to, at some point, buy a domain name or hundreds of domains that you never use, which is exactly what we’ve done [crosstalk 00:01:09]. I get the invoices. I’m aware. The craziest business ideas that we had five years ago and for some reason we’re still buying domain names. Well, we’re actually talking about your main domain name, so what you’ll actually use for your core personal brand business website. It’s really important because there are a few different ways you can go about this, which is exactly why we decided to have a chat about it. What kinds of different domain names could you choose? Okay, so when it comes to domains then for personal brands, what are the ways that you can go about it? What options are available? Okay, so there are three main things that we see people do with domains. The first thing is you actually use your name, so martinhuntbach.com or lyndsaycambridge.com. A few of the highly successful entrepreneurs out there, like Marie Forleo, uses her name within her domain name. Chris Ducker, he uses his name. It just means that you’re essentially taking your name and you’re the personal brand, so that’s what I’m going to have and whatever it is dot com, dot call it UK, dot net but it’s your name. That’s one option that you have. Another option would be to use your business name. For instance that’s what we decided to do, Jammydigital.com. Although technically it’s not a personal brand type business, lots of other personal brands decide to use a business name like Pat Flynn, for instance, has Smart Passive Income. Chris Marr has the Content Marketing Academy. That is a fairly common way to go as well. The third option isn’t used as much but it used occasionally. It’s where people decide to use a keyword. Potentially something that somebody might search for on Google and you actually use that word as your domain name. Now I’m not sure this is exactly what Mark Schaefer has done with his website businessgrow.com, but potentially he could have used MarkSchaefer.com or he could have used MarkSchaefersolutions.com if that’s his business name. For whatever reason some people decide to try to include a keyword within that domain. You do see it fairly frequently with local businesses, web design companies. I’ll just use WebDesign.com or WebDesignBlackpool.com. You do see it from time to time and occasionally with personal brands as well. Those are the three potential options you have available. Why would you use your name as your domain name? Let’s break it down then. What are the best options? Why would you use your name, for example, as your domain name? What are the advantages of doing that? Well it’s a lot easier to remember somebody’s name. If you bump into someone at a conference, for instance, or a local networking event people generally remember people more than they remember business names. It’s just more memorable and that’s a great thing that you can do if you use your business name, people can actually refer to you when they’re making recommendations or check out this person. It makes it a lot easier to find you online. Yes definitely, and it’s a good point that you say that actually because whenever I Google Pat Flynn I always put into Google Pat Flynn, I never actually put in Smart Passive Income. Not that I forget it, I know actually that that’s his business name, I know that it’s his domain name, but for some reason just psychologically I think I just Google Pat Flynn because yes I remember his face and his name. Yes, it’s much, much more memorable. That’s a really good point. What are the other reasons someone might use their name as their domain name? Well it’s easy to change business direction. We know from our own experience that we’ve changed our business quite a lot in the past five years, and sometimes you offer one service, you might offer something else, and if you use your name as your domain name it’s quite easy to make that transition and nobody bats an eyelid. If one day you decide that you’re no longer a SEI expert, you’re a web design expert, then nobody would know because you got your name as your domain name. If you decide to sell houses one day nobody would bat an eyelid, well they might do, but generally speaking it’s not going to raise any red flags if you decide to change your business direction because your name is something that you own and you keep, and you can take it in whichever business direction you want. It’s more adaptable. Yes, that’s very, very true actually. Yes because, say for example Chris Marr, Content Marketing Academy, he for some strange reason decided he wanted to do social media management instead. Then Content Marketing Academy wouldn’t make sense obviously as his domain name. Whereas if his name was ChrisMarr.com then he would be able to change direction. That’s just an example, but yes it’s a really, really good point actually that you can sort of change direction quite easily. Which I supposed if you’re new to business we noticed that when we were quite new to business that we changed quite a lot at the beginning so that’s always quite a good advantage, isn’t it that you have that sort of flexibility really and space to move without sort of feeling restrained just by something simple, by your domain name. What are the downsides of having your name as your domain name? Yes exactly, but there are a few negatives to potentially having your name as your domain. For instance it would be quite difficult for the likes of Chris Ducker and Marie Forleo to sell their website if they ever decided to pack it all in and do something else because their name is their domain name. Unless you find somebody else with the exact same name, that offers the same services, and has a similar reputation, it’s going to be fairly difficult if not impossible for you to sell a domain with your name and have somebody else take over it. That’s one of the downsides to it, it’s not saleable. Another reason is that it’s not immediately clear what it is that you offer. If you use your name MartinHuntbach.com or whatever, it’s not immediately clear how that person can benefit. For instance, we have Jammy Digital as our name and it’s kind of digital. We’ve included the word digital in it so you can kind of start to think about what it might be. Whereas if we only used our name then it’s not going to be clear at all, I could be doing anything. I suppose the advantage of having the flexibility of having to move around in your business is also a bit of a disadvantage because then it’s kind of not really clear what you do. Yes, so that’s kind of the downside of it really. Yes exactly, and it can make it even more difficult using your name as a domain if people struggle to spell it or if they struggle to say it like our names, for instance. Exactly. I actually do have MartinHuntbach.com but it just acts as bit of a landing page. No one’s going to be able to spell that. That’s an interesting one actually because you bought MartinHuntbach.com and originally it was you started the business, but I actually joined and now sort of co-own. If you’d have put MartinHuntbach.com that would have been really difficult kind of transition. Why would you use your business name as your domain name? I’d have just been plus Lyndsay, the end of it. That’s also a really good point actually. Sometimes if other people join your business that can be a sort of downside to just having one name, although it’s probably quite rare. Yes, that’s a really good point as well. What about the business name then? This is fairly common for personal brands too. What are the benefits of that? The first thing is that it’s very saleable. We’ve already discussed this in the previous point. If you have a business name as your domain name, then somebody else can buy your business off you in the future, they can buy a domain name that’s linked to a business because it’s not linked to a person. Generally speaking you’d probably get a lot more money if you ever did decide to sell a business. For instance, Pat Flynn, I know that he has the domain name PatFlynn.com, but he has now built his brand around Smart Passive Income. He could potentially sell that for a lot more than he could if he just used PatFlynn.com. People might buy it for the domain name quality, they might buy it because of the amount of traffic he’s got, but definitely going to count in his favor because he’s using SmartPassiveIncome.com, it’s a lot easier to sell. Yes, it’s a really good point actually. I think a good example of this is actually from Martin Lewis who had MoneySavingExpert.com and he sold it recently, in the last couple of years, for a lot of money. Millions and millions of pounds. Perhaps if he was called MartinLewis.com rather than Money Saving Expert it might not have been as easy to sell, so that’s a really, really good point actually. I suppose it depends if we want to sell or if we think we’re going to sell in the future. Exactly, you just never know. You never know, and the thing is is technically speaking Money Saving Expert is definitely still Martin Lewis. When you say Money Saving Expert, you might not know it if you’re not in the UK, but he advises people on how to save money and how to save money on bills and whatever. He is deeply ingrained within Martin Lewis, the Money Saving Expert. They actually, when they bought it, they actually hired him, I believe. He knows how it works. He then got paid even more money for working with them. Yes, swings a round about. If you can build Money Saving Expert. If you can build that business you’re golden. What are some other good reasons to use your business name as your domain name? Well I mean you can really make it clear what you do. That example, for instance, Money Saving Expert you know pretty much exactly what you’re going to get. Whereas with MartinLewis.com you’re not sure. It could be an insurance broker, it could want to fix your roof, you just don’t know. That’s the thing really. A major benefit is you potentially can explain a little bit more about what you do rather than just using your name, which can be a bit cryptic sometimes. Why would someone not use their business name as their domain name? Okay then, so why might we not use our business name as our domain name? Okay, so if you use a business name it does actually tie you in. When we said before that you can change your business direction with your name, you can’t do that as much, especially if you’ve got something like Smart Passive Income. If you decide to change your business it does tie you into a niche or whatever kind of industry. Sometimes you can have quite a broad explanation and that gives you a little bit more wiggle room, but if you want to dramatically change it, it does kind of tie you in, which can be frustrating. Yes, I think that’s a really good point actually because when we set up Jammy Digital we offered SEO, we offered web design, I think we offered social media logo design, everything in the world. It all at least fell under the umbrella of digital, so we’ve slowly got rid of some of those services, but it didn’t actually matter because it was quite a broad word that we used, digital, which covers all our things. Whereas if we wanted to be estate agents then that’s obviously not going to work, but at least it was broad enough to begin with where we could kind of move around a little bit in at least our niche, which was digital marketing. That’s a good point. Are there any other reasons why someone might not want to use their business name as their domain name? Occasionally when you have a business name as your domain name it can be a little bit less personal. It’s not as easy to connect with somebody, especially if they’re a personal brand. I can refer to you by your name. I want to build a little bit more rapport with you. I might consume some of your content. It’s just not as easy if you use a business name, but again there are pros and cons to it, but that’s one thing that we’ve found. Yes definitely. I think they are obviously things you can do to kind of combat that. I think there are quite a few examples. I know Pete Matthew comes to mind. He runs Meaningful Money, so that’s his … Obviously business name is his domain name, but a lot of people know Pete Matthew because he puts so much effort into his podcast, into his content marketing. I think it’s about yes, if you’re going to sort of use your business name as your domain name then you kind of have to put yourself forward as well for a lot of it. It’s the same with Chris Marr at the Content Marketing Academy. Everyone knows him just as much as they know CMA, Content Marketing Academy. 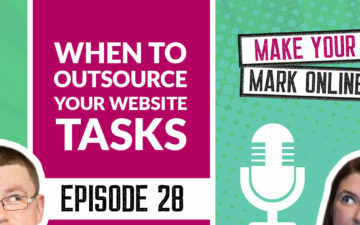 You kind of just have to make sure you ramp up that effort really in terms of content marketing and getting yourself out there and putting yourself out there and your face out there. Exactly, and another thing that you might potentially find if you use a business name is that like Lyndsay said before, it can actually be quite difficult for people to find you. When you were searching for Pat Flynn, which is naturally what people do, they’ll remember a name, they’ll remember a face, and they go and type into Google. If your business name is your domain name then it kind of takes somebody a split second to work out okay, which result do I click on here? Yes, all sorts of things come up. Yes, that’s a really good point. Your actual website might be knocked down the rankings a little bit. It might be on the first page but it might be the fourth or fifth one, which takes people an extra second or two to find your website, which can be frustrating. Should you have a keyword in your domain name? Yes definitely. Okay, so what about the last one then, which was using keywords in your domain? Is that a good idea? I understand the appeal with this one. I understand that if you are a public speaking coach, for instance, and you have PublicSpeakingCoach.com then the appeal is that okay, when people type that into Google they’re going to get to my website. In reality that used to be the case, it used to be easier to rank higher on search engines for a keyword if you had it in your domain name, but it’s not the case anymore. It actually does have some weight, but not as much as it used to. I generally wouldn’t recommend this one unless there’s a real reason for it, but I’m yet to find one. One of the main pros is the fact that it does offer some weight but not enough for me to decide to build my entire website on it. Okay, so I mean I know that it’s not one that you’re very keen on but are there any other reasons why someone might just want to use a keyword in their domain? Yes, obviously you’ll make it abundantly clear what it is that you do. I mean if we chose, for instance, Web Design Blackpool then people know what they’re going to get. It’s immediately clear, it wouldn’t be immediately clear if somebody used their name. There’s that I suppose. Do you think this is quite good for businesses then that are very, very local, quite small local businesses? Do you think it would be suitable for that? I mean I’m trying to find some good points of using this, sort of Accountants Blackpool or Web Design Manchester. Is there any kind of good stuff coming out of it? What are the disadvantages of using a keyword in your domain name? It depends really on how much competition you have. 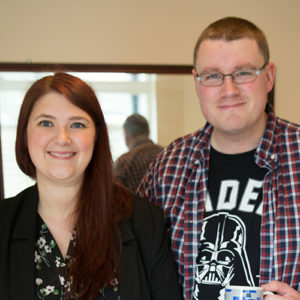 There’s still an argument to say that if there’s no other accountants in Blackpool that know anything about SEO, just by buying that domain name and adding some content to your website you might potentially rank highly on the first page of Google. Yes, but there’s so many websites popping up all over the place now that there’s too much in regards to SEO and branding are going to add more than just stuffing your keyword within your domain. I would say that this one is not so great of an option, but I do see people do it, which is why we wanted to include it. More often than not it can be a bit confusing. I mean if you search for somebody online you want their name to pop up or at least their business name. It’s kind of like three layers deep. It’s not the name of the person, it’s also not the business that they run, but it’s something else and it just looks a bit spammy I think in this day and age. Yes definitely. I think it looks a little bit old fashioned as well, doesn’t it? Just not very professional. Yes, I absolutely agree with that. Also it ties you in. You can’t get away from it. If you’re stuffing WebDesignBlackpool.com into your domain name and you decide to move house in five years to Manchester then it’s not really going to work. You kind of shot yourself in the foot a little bit there. Yes, plus it just you just so … It’s just kind of boring if I’m honest. I mean imagine if our domain name wasn’t Martin Huntbach or MartinandLyndsay.com, it wasn’t JammyDigital.com, it was web design Manchester. It just doesn’t excite anyone, does it? We can definitely see the bad points on that one, can’t we? Exactly, but some people do still ask that question, “Is it best if I pop the keywords in my domain?” Ninety-nine times out of 100 we say no. It’s far better to choose a domain with your name or your business name. What’s our favourite domain name option for personal brands? What’s the best option then? Have you got a favorite personally? Where possible I think you should try to use your name. Again taking everything into account, the pros and cons, and I think that the benefits far outweigh the negatives when it comes to choosing a domain name and including your name. The fact that you can change direction, the fact that you can brand yourself as much as you like, and it doesn’t actually take anything away from your name and your business. Again, including your business name has it’s benefits, but for personal brands people search for you online. People will recommend you. People won’t always remember the name of your business. It all depends if you want to sell it further down the line. If that’s your main objective then by all means. I would always choose to go with a brandable thing, whether that’s branding you or branding a business name, there are pros and cons to each and there’s no clear defined answer that’s going to work for everybody. Generally speaking if I was to go out by myself and want to build a business behind my knowledge and my experience I would generally build it behind MartinHuntbach.com. Okay, that’s really interesting. Even if you couldn’t spell Huntbach. The thing is you still have people refer people to you. People hear us on podcasts, people see us speak at local workshops, and people read guest posts. People will naturally find your name and there’s lots of people on the internet who have more complicated names to spell but they still make it work, especially if you’ve got the full weight of your business behind it. It’s still a great idea. I do understand the appeal of a Smart Passive Income, for instance. You can still do it, and like I say, if you go all in on it people will closely link the business name with your name and that’s fine if you can find that balance, but more often than not the best case scenario for most personal brands is to actually just put your name behind it. There is one last thing that I wanted to say, which is even if you decide to go for a business name domain name, you should still buy your name. I mean I did it. I didn’t intend to use it originally. We’ve got LyndsayCambridge.com. It’s the best thing to do is even if you decide to go with a business buy the domain name. You can set up forwarding, so you can actually if somebody does type your name into the address bar at the top of the page you could potentially redirect people to your main website. Especially if you decide to use it in the future just get it, pay the 10 pound a year, whatever it is, and then just store it. If you don’t decide to use it then that’s fine, but I would always recommend buying it. Yes, it’s a really, really good point actually. We have MartinHuntbach.com, LyndsayCambridge.com, don’t visit LyndsayCambridge.com. There’s some really crap videos on there. Now everyone’s going to visit. That sounds actually really dodgy. It’s just some videos doing book reviews, not very exciting I’m afraid. Yes, that’s a really, really good point. Buy your name as your domain name. It’s always good to have that anyway because you don’t know when it’s going to be useful. I actually read, I forgot where I read it, but people are buying their children’s name as their domain names and then give … I don’t know if Martin might be doing that, [inaudible 00:21:38]. Thought I’d buy it today. Thought I’d buy it today. Don’t worry Huntbach will be available, it’ll be fine. It’ll be available, we don’t need to spend 10 pound a year until he’s 18 and needs it or whatever. Yes, people actually do, they’re starting to buy their children’s names, the domain name. Because in the future you don’t know when they’re going to need it. Yes, that’s a really, really interesting one. That was a really, really good episode actually on how to choose your domain name, episode 11 there. Just before you go I just wanted to remind you that our wait list is up for our Make Your Mark online membership community. Pop your name and email address in there and you’ll be signed up to the wait list, that’s when you can join us at the lowest ever price. We have confirmed the price now, it will be $29 per month or $290 each year. Cheap, but that will be a limited price Martin. It will only last two weeks that price and then it will be going up after that. Get your name down quickly, make sure you join us for that really, really low price offer. Thanks for listening.